An alternative to using individual LEDs for building lighting is the adhesive-backed SMD LED Strip. 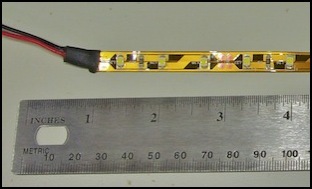 This is a flexible circuit board formed as a long strip of small surface-mount (SMD) LEDs, typically arranged in sets of three LEDs in series and the necessary resistor for use with a 12 volt DC supply (variously given as tolerating 9-14 volts and 9-18 volts). Each set is about two inches (50mm) long, and can be cut off individually. And each set has pads at both ends that can be soldered to. If more LEDs are needed in a row (e.g., for lighting under a platform roof) power only needs to be connected to one end, and all sets will draw from it in parallel. Credit where it’s due: the core of this idea comes from Jerry, author of Quinntopia (who also has a two-part article on LED lighting), although it was elaborated a bit in a discussion on JNS Forum where others (Inobu, Bernard and Jeff (cteno4)) also added useful ideas. I did a bit of research to find other suppliers and technical info about the LEDs summarized here. Note: like any semiconductor, LEDs can be harmed by static electricity. While LEDs are fairly robust, taking some of the usual ESD precautions when working with them is probably a good idea. These SMD LED strips are sold for use as decorative lighting, and come in a variety of colors and specialized forms. The flexible circuit board (essentially a thin strip of plastic with copper traces) is normally a yellowish color, but can also be had in black and white versions (for an extra cost). Waterproof versions for outdoor use are also available. Versions with a single LED per group or with LEDs that aim sideways, rather than away from the backing are also available. But for our purposes, the basic three-LED-per-group, 12V, yellow-color strip with LEDs emitting either “white” or “warm white” light are what we want. These are available with two kinds of LEDs, an ordinary (type 3528) LED that emits about 2,000 milli-candela (mcd) per LED, and a high-intensity (type 5050 LED) version that emits up to 5,000 mcd per LED. The latter requires correspondingly more power (~20 mA / LED versus ~7 mA/LED) and is more expensive. These strips are typically provided with an adhesive backing on the flexible circuit-board, so they can easily be attached inside a building (but if soldering on the wires, do that first to avoid melting the model). The 3528 LED gets its name from the size of the individual LED element: 3.5mm x 2.8mm. These are sold as 2mm thick by 8mm wide strips of varying lengths, with 1 foot (18 LEDs), 50 cm (30 LEDs) and 5m (300 LEDs) lengths typical. The term “reel” below refers to a 5 meter (16.4 foot) strip sold on a reel; the typical “bulk” version of this product. Each LED emits light over a 120° angle, aimed away from the strip. Thus, these would normally be applied to the ceiling (or the underside of a platform canopy) and mimic built-in lighting fixtures. In a large building, more than one row of lights might be necessary. Th color of the “white” comes in three wavelengths: “white” generally means a daylight color, either 5000°K or 6000°K (or higher). Any of these are probably a bit too blue for most applications, but could be used for especially harsh fluorescent lighting. The “warm white” color can be either a very reddish 2700°K (which is probably suitable for residential incandescent lighting) or a more moderate 3100°K (probably still a bit yellow, but perhaps suitable for typical fluorescent building lighting although I didn’t like it). LEDs aren’t the most color-accurate lighting, but then the intent here is to replicate either outdoor fluorescents (which aren’t at all color-accurate) or for general building interior illumination, where inexact colors won’t be as noticeable. I found that a decent “fluorescent light” color could be achieved by putting a white (6000°K) and warm white (3100°K) strip of the same length next to each other. This still tends to be a bit bluish, but ends up around 4500°K and looks pretty good for station platform lighting, for example. I’ve ordered two spools to use for building and station lighting: one of Warm White, which is going to be appropriate for houses with incandescent lights (I think), although others seem to use these for situations using fluorescent lights, and a second of “white” (cool white) that should be better as a fluorescent light. 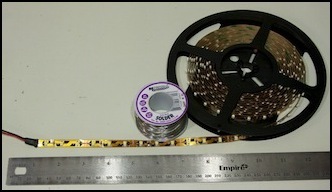 Both are of a similar design: the 5m spool is actually a set of 50 cm strips with 30 LEDs soldered together. Each of those is subdivided into 2” (5 cm) strips that can be cut apart, which contain three LEDs and a 120 ohm resistor. A 3528 LED can sustain up to 60mA currents; with this resistor, current should be around 25 mA @ 12V, and possibly half that (depending on variations in the actual forward voltage used by the LED). Which means that it should be safe to drive these with supplies above 12 volts, although the safe limit is probably below 16 volts (15 should be fine even in the worst case, and 16 might work depending on the individual LEDs). After installing two 20” sets (60 LEDs total) in my subway station, I saw a current of around 300-500mA (my analog meter isn’t too exact; I need to wire my good digital meter up and get better numbers). That works out to 15 - 25 mA going through each of the 2” long 3-LED strips (the strips are in parallel, so divide total current by 20 strips). Which matches what I estimated (25mA) above. By the way, the “warm white” LEDs seem to be around 3400°K, which is a bit higher than the “3100°K” some of the documentation gave it, although one label said “3100°K - 3400°K”. The “white” LEDs have a strong blue cast, which is a bit harsh even for fluorescent lighting. Adjusting white balance to gave me an acceptable photo with various settings from 5000°K to 5500°K, so I suspect the color is closer to that than to 6000°K, but it varied a lot. A bit more work confirms that the “white” is closer to 6000°K “daylight” (about 5900°K), which is why it appears so blue. This matches the “white” color advertised by some other vendors of these lights. If you were using daylight bulbs to light the layout, it might not look too bad (although many “daylight” bulbs are closer to 5000°K, which is “daylight in shadows” not 6000°K, which is “full sunlight” and tends to have a blue cast). My layout lighting is around 3400°K (I’d originally tried for 4100°K, but it ended up at the lower value), which is one reason it looks unnatural. In photographs it comes out fine if I chose the right white balance on the camera (or in post-processing the RAW image), but there was a pretty strong blue cast in person. As noted above I eventually solved this by mixing the two kinds of light (putting two strips next to each other). But there are implications to this I really hadn’t thought through. If you put one 2” strip per floor in a building, then a 6-story building needs 150 mA all on its own, and just ten of those would use up the entire 1.5 Amp power supply I’d planned to use. 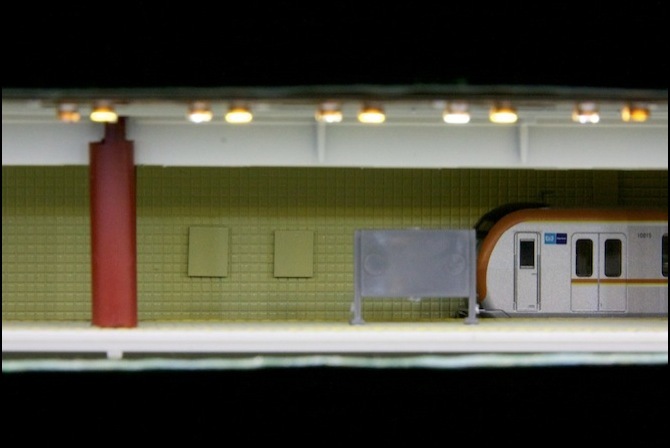 I should have more than that in my Urban Station scene. Time to plan on either a larger power supply, or more of them. At these amperages, I’m thinking “larger” is the more cost-effective answer. I think I’m going to use one (or possibly two) of the 5 Amp outputs from the PS2012 power supply for my two lighting circuits. I’m also concerned about the risk of blowing a bunch of LEDs if I make a wiring error. See the LED Lighting Power page for more on that topic. This page was originally written in early 2011, and costs have come down since then. Comparison shop for current prices rather than using these as a guide. You can get these strips in the U.S., but the actual strips appear to be made in China, and shops or Ebay sellers with more direct connections may have better prices. That said, you may find a good deal on Amazon (or rather, on one of the stores that operate through Amazon) or elsewhere if you look around. But since these are sold for “interior design” use (accent lighting), many sellers have substantial markups. Note: it’s not entirely clear which “warm white” he sells (or if he has both) since the specifications do not include wavelength. Amazon had a very limited quantity of what appeared to be the same 3528 white and warm white LEDs for US$44.99 and $45.50 at the time of writing (Feb 2011), but this may have been a clearance item from the actual seller (LED Wholesalers). They also had the 5050 strips for $125/reel. And they had both from a number of suppliers at other higher costs. However, I found it easier to find the things (on Amazon) using Google than Amazon’s own search function. In December 2012 I saw a 5m reel of 2700k (warm white) LEDs on Amazon for $14, so prices have dropped substantially since 2011. Note: shipping is international, arriving via Express Mail, and can take 1-3 weeks to the U.S. Again, it’s unclear which “warm white” is being sold. 3528 LED Strips in White (6000K) and Warm White (3100K), normally $95.94/reel of 300 LEDs (on sale Feb 2011 $58.50), also available by the foot with 18 LEDs/ft ($5.95/ft). 3528 LED Strips in White and Warm White, $60/reel (marked down to $45.50 in Feb 2011). I bought my first spools from this dealer (via Amazon); they arrived promptly, sealed in anti-static bags, and were exactly what I expected. Expensive, but useful if you only want a few (or need a few “now”). Caution: when using the adhesive backing, pulling off the paper tends to take the adhesive with it. You need to get your fingernail (or a sharp hobby knife) in between the paper and the adhesive, and peel the paper while holding the adhesive down. Pull the paper at a sharp angle back on itself once it’s started, and the adhesive should remain in place. You can re-attach the adhesive if it comes loose (it’s basically a thin layer of something like double-sided tape), but that’s awkward to do.